Fathima, 26, has been making bags for two years and loves keeping busy. She’s enjoyed sewing ever since she was a child and is now happily supporting her family through her own business with the full support of her husband, Abdul. In April this year Fathima took part in Plan International’s Youth Economic Leadership program where she learnt about self-employment and how to expand the market for her bags. 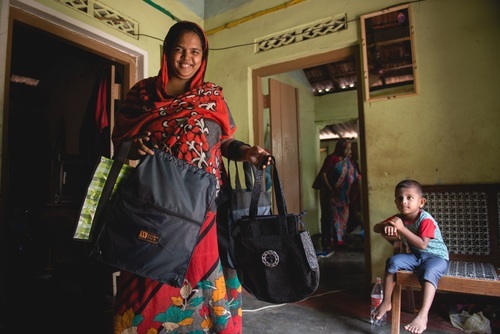 Originally Fathima had been selling her bags through a shop, with 450 sales a month. After the training she and Abdul decided to sell their products themselves. As a result they’ve been able to sell around 4000 bags per month. The business has grown so much that Fathima now hires two girls from their village to meet the supply demands. The pair make decisions together and work together on the business. Fathima rises at 4am to cook and Abdul takes the bags to sell. Fathima works from 9am to 1pm and then 4.30 pm to 7pm with time to rest in between. Abdul helps cut cloth in the evening and Fathima’s mother helps take care of the couple’s son. It’s a family effort. Strategy One has helped young women like Fathima skills to start her own business in Sri Lanka. Plan International’s project works with training centres to develop market-oriented courses and appropriate training methods and entrepreneurship training. The course has helped women like Fathima learn about self-employment and how to safely expand her business. $9,918 has contributed to over 20 vocational training and entrepreneurship courses for young people who are from some of the poorest families in Cambodia and Sri Lanka. They are now on a path of independence and empowerment.